The Galaxy Bedroom is one full of solid wood quality, contemporary style and ample storage. 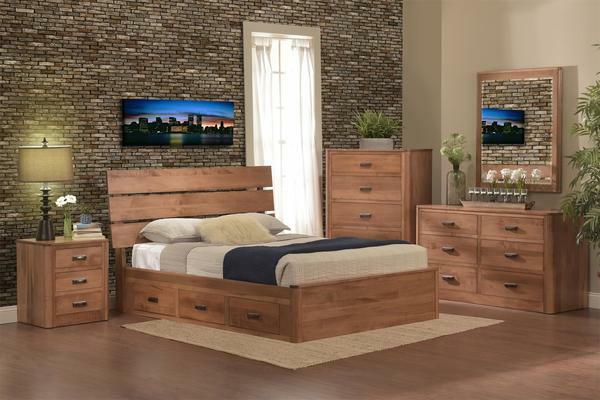 Shown here in brown maple wood, this wood bedroom furniture offers everything you need to create a bedroom that's a comfort to retreat to each night. This Amish made bedroom furniture is handcrafted just for your home. Amish made means extra attention is paid to every detail and you can always count on the finest quality materials. This bedroom set will last for generations to come. Take a look at custom bedroom furniture from DutchCrafters in this testimonial video from Edward and Brenda. Our experienced furniture specialists are here to assist you. Please call with any questions at 866-272-6773.